It is obtained from the root of the madder, a plant belonging to the Rubiaceae family, cultivated in the Mediterranean and Middle East. This is one of the most stable natural pigments, and for centuries it has been the most commonly used red dye. It is obtained from the root of the madder, a plant belonging to the Rubiaceae family, cultivated in the Mediterranean and Middle East. It was used by the Romans, Egyptians and the Greeks, who called it erythrodon. It is believed the the pigment was brought to Italy during the Crusades, and the European cultivation began in the 13th C. The pigment is known as “Rose Madder” by the artist. In 1826, the chemists Colin and Robiquet were able to isolate from this pigment the two main colouring agents of the Rubia tinctorum extracts, which were permanent alizarin and glitter. These extracts were used to formulate different hues of red, from brown to purple and blue. In 1868, the Germans Graebe and Lieberman managed to synthesise alizarin, commonly known as crimson, an industrial production began, after which only painters used the natural product. 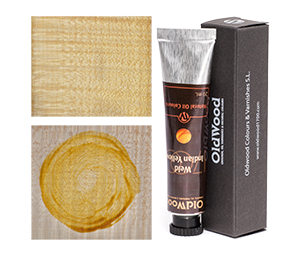 OLD WOOD uses the extract of Rubia tinctorum to make two different colours, Red and Brown Red. Both produce shades that are pure, bright, warm, transparent and full of life.